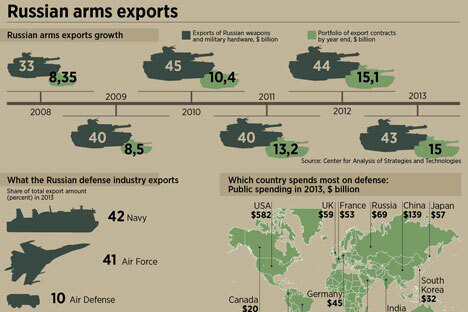 In 2013, Russian signed $49 billion worth of orders for the export of its weapons and military hardware. RBTH looks at the portfolio of orders to see what Russia exports, to whom and how much. The overall amount of Russian military export orders in 2013 reached a record-breaking amount of $49 billion, Russian President Vladimir Putin has announced. In 2013, "exports of Russian military goods and services rose by 3 percent to exceed $15.7 billion", overtaking the 2012 figures, he said. Putin went on to add that the U.S. accounted for 29 percent of the market; Russia, 27 percent; Germany, 7 percent; China, 6 percent; and France, 5 percent. Russian military exports went to 65 countries of the world. Furthermore, Russia has agreements on military-technical cooperation with 89 countries. "Military-technical ties with our traditional partners enjoyed a dynamic development. These are: the CIS, CSTO (Collective Security Treaty Organization) member states, India, Venezuela, Algeria, China, and Vietnam. In addition, new arms markets were explored, primarily in Latin America," Putin said, as quoted by the RIA Novosti news agency. Based on RIA Novosti and Vzglyad.